100% driving cache. No need to get out of your car. 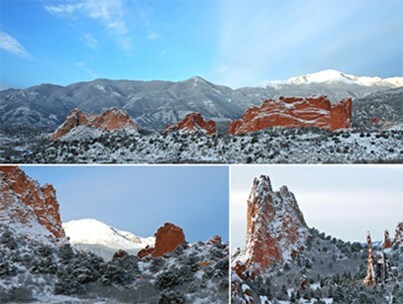 To the immediate west of Colorado Springs, Garden of the Gods is one of the most amazing geological sites in North America. In the late Paleozoic gravels and sands eroded from nearby mountains. Over a period of 300 million years sediments more than one mile deep were deposited. They were compressed, cemented, and aged beneath ancient oceans. With the building of the present day Rocky Mountains the resulting sandstone and conglomerate, were stood on end -- horizontal to vertical. Over time the sandstone was eroded by wind and rain leaving the amazing formations we see today. Waypoint 1: 38 52.862N 104 52.792W. The Tower of Babel, The Kissing Camels, the North Gateway Rock, and Signature Rock are sites to behold and photograph. Waypoint 2: 38 52.877N 104 52.957W. At the pull off, looking to the Southeast you can see amazing views of the formations at Waypoint 1, and also the Twin Spires of Sentinel Rock, and Pulpit Rock (almost due South). Take some photos. Waypoint 3: 38 52.668N 104 53.003W. Just before the fork in the road, step on a trial to the West and see Giant Footprints. Waypoint 4: 38 52.333N 104 53.118W. Scotsman Picnic Area is a wonderful place to relax with the family. Plenty of Parking and some time to hit the miles of trails throughout this site. Waypoint 5: 38 51.887N 104 53.840W. Balanced Rock is one of the most recognizable sites in Colorado. Now buttressed just a little, this rock has been balancing precariously for thousands of years. Waypoint 6: 38 52.532N 104 52.940W. A great place to park so that you can take in Keyhole Window, Sleeping Giant, and Cathedral Rock. Waypoint 7: 38 51.943N 104 52.751W. Take in the amazing vistas. Looking to the West you’ll see one of the world’s largest batholiths. We know it better as Pikes Peak. Waypoint 8: 38 52.205N 104 52.692W. At South Parking Lot you have nearly completed your drive. When did the sedimentary formations of the Garden of the Gods "tilt up?" ...how many millions of years ago? Did this sedimentary uplifting occur before or after extinction of dinosaurs? Trbpnpuvat va Tneqra bs gur Tbqf vf fgevpgyl cebuvovgrq ol gur Pvgl bs Pbybenqb Fcevatf. uggc://jjj.fcevatftbi.pbz/havgf/cnexferp/thvqryvar.ugz Ubjrire, pbafvqrevat gur havdhr tbnyf bs RneguPnpur.bet, guvf qevir jnf fcrpvsvpnyyl nccebirq ol gur Cnexf Qrcnegzrag.